Bahadori, M., Mahmoodi Kordi, F., Ali Ahmadi, A., Bahadori, S., Valizadeh, H. (2015). Antibacterial evaluation and preliminary phytochemical screening of selected ferns from Iran. Research Journal of Pharmacognosy, 2(2), 53-59. M.B. Bahadori; F. Mahmoodi Kordi; A. Ali Ahmadi; Sh. Bahadori; H. Valizadeh. "Antibacterial evaluation and preliminary phytochemical screening of selected ferns from Iran". Research Journal of Pharmacognosy, 2, 2, 2015, 53-59. Bahadori, M., Mahmoodi Kordi, F., Ali Ahmadi, A., Bahadori, S., Valizadeh, H. (2015). 'Antibacterial evaluation and preliminary phytochemical screening of selected ferns from Iran', Research Journal of Pharmacognosy, 2(2), pp. 53-59. Bahadori, M., Mahmoodi Kordi, F., Ali Ahmadi, A., Bahadori, S., Valizadeh, H. Antibacterial evaluation and preliminary phytochemical screening of selected ferns from Iran. 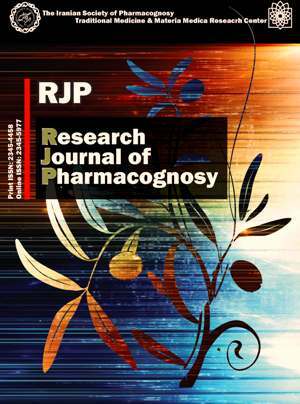 Research Journal of Pharmacognosy, 2015; 2(2): 53-59. 1Department of Chemistry, Faculty of Sciences, Azarbaijan Shahid Madani University, Tabriz, Iran. 2Department of Biology, Faculty of Sciences, Azarbaijan Shahid Madani University, Tabriz, Iran. 3Department of Biology, Medicinal Plants and Drugs Research Institute, Shahid Beheshti University, G. C., Tehran, Iran. 4Department of Plant Biology, Faculty of Biological Sciences, Tarbiat Modaress University, Tehran, Iran. 5Department of Chemistry, Islamic Azad University, Miyaneh Branch, Miyaneh, Iran. Background and objectives: The main aims of this study have been finding out the antibacterial activity and preliminary phytochemical screening of some fern species. Methods: The antimicrobial activity of the methanol extracts of Polypodium interjectum Shivas, Polystichum woronowii Fomin, Polystichum aculeatum (L.) Roth., Dryopteris affinis (Lowe) Fraser-Jenk, Athyrium filix-femina (L.) Roth, Asplenium scolopendrium L., Asplenium adiantum-nigrum L. and Pteris cretica L., was screened by measuring the minimum inhibitory concentration (MIC) and minimum bactericidal concentration (MBC) values against two Gram positive and Gram negative bacteria, Escherichia coli and Staphylococcus aureus, using standard assays. Besides, the phytochemical evaluation and measurement of the total flavonoid contents were also performed. Results: The maximum activity was exhibited by the extract of Dryopteris affinis with MIC value of 2 µg/mL. Polystichum aculeatum showed the same antibacterial potential against S. aureus. Some of the extracts had strong antibacterial activity (2-8 µg/mL) and others demonstrated moderate activity. Phytochemical analyses showed the presence of some important secondary metabolites in Iranian fern species. Triterpenoids and polyphenols were present in rhizome and aerial part of all plants. Total flavonoid contents range was 1.66 to 44.22 mg of catechin equivalents per gram of dry extract. Conclusion: Findings indicated that Iranian ferns have good antibacterial potential and could be a suitable source for antibiotic drug discovery. Valizadeh H, Mahmoodi KF, Kouhkan R, Bahadori MB, Moridi FM. Isolation and structure elucidation of coumarin and cinamate derivatives from Lycium ruthenicum. Iran Chem Commun. 2014; 2: 277-282. Mahmoodi KF, Valizadeh H, Hosseinzadeh Z, Bahadori MB. Furanocoumarins from Heracleum rawianum in Iran. Iran Chem Commun. 2015; 3: 1-6. Sonboli A, Bahadori MB, Dehghan H, Aarabi L, Savehdoroudi P, Nekuei M, Pournaghi N, Mirzania F. Chemotaxonomic importance of the essential oil composition in two subspecies of Teucrium stocksianum Boiss. from Iran. Chem Biodivers. 2013;10: 687-694. Valizadeh H, Mahmoodi KF, Alizadeh Z, Bahadori MB. Isolation and structure elucidation of secondary metabolites from Echinophora platyloba DC from Iran. J Med Plant. 2014; 13: 15-21. Braga MBM, Souza TG, Santos KA, Andrade JC, Guedes GM, Tintino SR, Souza CS, Costa JGM, Menezes IA, Saraiva AF, Coutinho HM. Antimicrobial and modulatory activity of ethanol extract of the leaves from Lygodium venustum SW. Am Fern J. 2012; 102: 154-160. Singh M, Singh N, Khare PB, Rawat AKS. Antimicrobial activity of some important Adiantum species used traditionally in indigenous systems of medicine. J Ethnopharmacol. 2008; 115: 327-329. Hanus LO, Rezanka T, Dembitsky VM. A trinorsesterterpene glycoside from the North American fern Woodwardia virginica (L.) Smith. Phytochemistry. 2003;63: 869-875. Ding ZT, Fang YS, Tai ZG, Yang MH, Xu YQ, Li F, Cao QE. Phenolic content and radical scavenging capacity of 31 species of ferns. Fitoterapia. 2008; 79: 581-583. Britto JD, Gracelin HS, Kumar PBJR. Phytochemical studies on five medicinal ferns collected from Southern Western Ghats, Tamilnadu. Asian Pac J Trop Biomed. 2012; 2: 536-538. Santos MG, Kelecom A, Paiva SR, Moraes MG, Rocha L, Garrett R. Phytochemical studies in pteridophytes growing in Brazil: A Review. Americas J Plant Sci Biotech. 2010; 4: 113-125. Mozaffarian VA. Identification of Iranian medicinal and aromatic plants.1st ed. Tehran: Farhange Moaser Press, 2012. Eskandari M, Riazi B, Shirzadian S, Mazooji A. Investigation of fern species in Guilan province. Rostaniha. 2012; 13: 1-9. Singh M, Govindarajan R, Rawat AK. Antimicrobial flavonoid rutin from Pteris vittata L. against pathogenic gastrointestinal micro flora. Am Fern J. 2008; 98: 98-103. Chen YH, Chang FR, Lin YJ, Wang L, Chen JF, Wu YC, Wu MJ. Identification of phenolic antioxidants from sword brake fern (Pteris ensiformis Burm.). Food Chem. 2007; 105: 48-56. Zhang M, Cao J, Dai X, Chen X, Wang Q. Flavonoid contents and free radical scavenging activity of extracts from leaves, stems, rachis and roots of Dryopteris erythrosora. Iran J Pharm Res. 2012; 11: 991-997. Soare LC, Ferdeş M, Stefanov S, Denkova Z, Nicolova R, Denev P, Bejan C, Paunescu A. Antioxidant activity, polyphenols content and antimicrobial activity of several native pteridophytes of Romania. Not Bot Horti Agrobo. 2012; 40: 53-57. Chai TT, Elamparuthi S, Yong AL, Quah Y, Ong HC, Wong FC. Antibacterial, antiglucosidase and antioxidant activities of selected highland ferns of Malaysia. Bot Stud. 2013; 54: 55. Rezanka T, Dembitsky VM, Hanus LO. Two cyclohexenone glycosides from the North American fern Woodwardia virginica (L.) Smith. Phytochemistry. 2003; 63: 931-937. Choudhary MI, Naheed N, Abbaskhan A, Musharraf SG, Siddiqui H, Rahman A. Phenolic and other constituents of fresh water fern Salvinia molesta. Phytochemistry. 2008; 69: 1018-1023. Molina M, Garcia VR, Santayana MP. Local knowledge and management of the royal fern (Osmunda regalis L.) in Northern Spain: implications for biodiversity conservation. Am Fern J. 2009;99: 45-55. Zhao Z, Jin J, Ruan J, Zhu C, Lin C, Fang W, Cai Y. Antioxidant flavonoid glycosides from aerial parts of the fern Abacopteris penangiana. J Nat Prod. 2007; 70: 1683-1686. Chen YR, Chang FR, Lin YJ, Hsieh PW, Wu MJ, Wu YC. Identification of antioxidants from rhizome of Davallia solida. Food Chem. 2008; 107, 684-691. Teke GN, Kuiate JR, Kuete V, Teponno RP, Tapondjou LA, Tane P, Giacinti G, Vilarem G. Bio-guided isolation of potential antimicrobial and antioxidant agents from the stem bark of Trilepisium madagascariense. S Afr J Bot. 2011; 77: 319-327. Harborne J. Phytochemical Methods.1st ed. London: Chapman and Hall Ltd, 1973. Olsen S. Encyclopedia of Garden Ferns. 1st ed. Portland: Timber Press, 2007. Simpson MG. Plant Systematics. 1st ed. Massachusetts: Elsevier Academic Press, 2006. Jorgensen JH, Hindler JF. New consensus guidelines from the clinical and laboratory standards institute for antimicrobial susceptibility testing of infrequently isolated or fastidious bacteria. Clin Infect Dis. 2007; 44: 280-286. Alcaraz LE, Blanco SE, Puig ON, Tomas F, Ferretti FH. Antibacterial activity of flavonoids against methicillin-resistant Staphylococcus aureus strains. J Theor Biol. 2000; 205: 231-240. Cushnie TPT, Lamb AJ. Antimicrobial activity of flavonoids. Int J Antimicrob Ag. 2005; 26: 343-356. Lin Y, Shi R, Wang X, Shen HM. Luteolin, a flavonoid with potential for cancer prevention and therapy. Curr Cancer Drug Tar. 2008; 8: 634-346. Lai HY, Lim YY, Kim KH. Blechnum Orientale Linn - a fern with potential as antioxidant, anticancer and antibacterial agent. BMC Complem Altern M. 2010; 10: 15. Chew YL, Goh JK, Lim YY. Assessment of in vitro antioxidant capacity and polyphenolic composition of selected medicinal herbs from Leguminosae family in Peninsular Malaysia. Food Chem. 2009; 116: 13-18.